6th Annual Perennial Plant Sale! Help Yourself 6th Annual Perennial Plant Sale! Help Yourself! is 501(c)3 for-benefit corporation that plants and maintains community fruit trees and gardens in many locations around Valley, free for all to harvest from. Each spring, we offer low-cost native fruit and nut shrubs and trees, perfect for hedges, yards and gardens each spring, our proceeds directly funding the year's public planting projects. Over their long lives, they will yield bushels of fresh fruit, beginning in 3-5yrs. Sourced from NE nurseries, they will grow rapidly with good care. Pick up bare root, 6-18” seedlings, with instructions in Northampton, Greenfield or Holyoke early June, details to come. Shipping available by arrangement. Hazelnut – American. Excellent hedge. Need 2+ for nuts. Space 5-10'. Juneberry – Serviceberry (A. alnifolia). Shrub to 10'. Space 5-8'. Delicious berries. 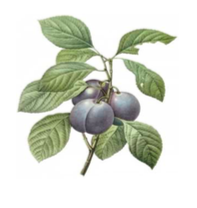 Black aronia berry – Chokeberry. Nutritious, astringent fruit used for juice. Shrub to 8'. Black Elderberry – shrub to 10'. prefers moist soil. Edible/med. Berries. Chinese chestnut– to 50', spreading shade tree with sweet nuts. Need 2+ for fruit. Redbud– Nitrogen fixing tree to 20'. Beautiful, edible, sour red flowers in spring. Bee forage. Paw paw – to 30'. Large, soft tropical tasting fruit. Tolerates wet soil. Need 2+ for fruit. Announcing 5th Annual Spring Perennial Plant Sale! Help Yourself 5th Annual Perennial Plant Sale! 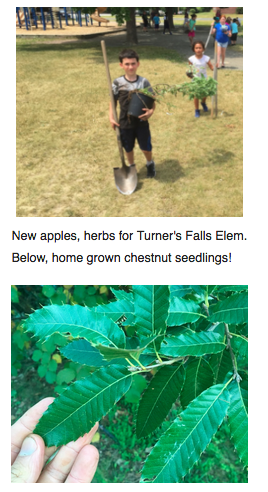 Each spring, we offer low-cost native fruit and nut shrubs and trees, perfect for hedges, yards and gardens each spring, our proceeds directly funding the year's public planting projects. Over their long lives, they will yield bushels of fresh fruit, beginning in 3-5yrs. Sourced from NE nurseries, they will grow rapidly with good care. Pick up bare root, 6-18” seedlings, with instructions in Northampton, Greenfield or Holyoke early June, details to come. Order by cash, card, PayPal or check. We're seeking volunteers, stewards and yards to host seedlings as they grow large enough for public plantings. To order, email helpyourselfnoho@gmail.com with desired species and quantity, preferred pick up location and method of payment. Persimmon– med. tree to 50'. Unsexed, females bear delicious fruit, need males nearby. Redbud– Nitrogen fixing tree to 20'. Pretty, edible, sour pink flowers in spring. Bee forage. Shinko & Bubblegum plums (Japanese) - to 15'. 25$ Each, limited qty. Hops – (english) fast climbing vine to 20', med. flowers used as sedative and bitter beer. The season of gratitude is upon us! We, corporeal beings all, owe the existance of our earthly bodies to those other beings we eat. If you've enjoyed the blessing of eating food once or more in your life, consider paying it forward by planting a public fruit tree, here on Earth! Meanwhile, the winter solstice is fast approaching, and gentle fall rains offer relief to the dry ground, it's a nice time to reflect back on a busy - and parched - growing season. Do you live and eat in the Pioneer Valley? This #GivingTuesday "plant your money where your mouth" is (locally), and invest in our shared future! Plant a public fruit tree today! Sponsor a public fruit tree! Give the gift of a public fruit tree to a local community with the link below. 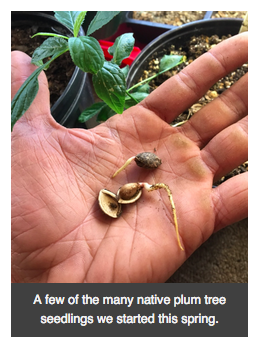 Each 25$ directly plants a fruit tree in public location in Western Mass, free for all to harvest from. 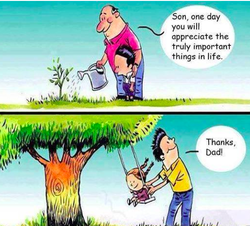 We all love to save our dollars, but remember, trees live longer than we do, feeding and blessing those we leave behind. Why wait to plant a better future? Community orchard at the Parish of the Holy Name Church, South Deerfield. A few weeks ago I was visiting some old friends who run the horse powered Abode Farm CSA in New Lebanon NY. One of them works part time at near-by Micosta Enterprises, a diverse berry farm growing all manner of uncommon fruit - cornelian cherry, hardy kiwi, seaberry, currents, aronia, blueberry, gooseberry, quince and more for wholesale and processing into nutrient dense & tasty syrups and extracts. He mentioned that they'd be pulling out a whole long row of black currants to make room for blueberries for some economic reason or another. The whole row (50 or more) currants would be composted! Lunch guest helping itself to workers' picnic! Inspired, and looking for an excuse to return, at the appropriate day, a few of us HYS volunteers returned in a 15' UHaul. Over a long, sunny afternoon we dug up 50+ black currants - 'Ben Sarek', 'Titania', and other varieties, and mulched them in on a tarp in the truck. We also scored a bunch of red currants, gooseberries and potted apples and trees that needed homes. We schlepped these back to northampton, where we soaked them and mulched them again. Loaded with fruit, close to midsummer, it was the worst time of year to transplant them, but it was then or never. After harvesting some berries and pruning them back by 50%, I think they will do OK! Unloading the packed and mulchy UHaul bucket-brigade style... despite all the mulch and earwigs we swept out, no extra cleaning fee was billed! These got ALL planted out over the next few days, along the Help Yourself plantings on the Manhan Rail Trail (b/t Conz and Pleasant St., and across Old S St. from Soo-ra Restaurant), at the Hampshire Council of Governments lawn, and heeled in elsewhere. Many of these bushes were divided 2 or 3 times, so all told, 75 currant bushes were put in at public plantings in the area, which will, of course, yield countless cuttings and berries over the coming years. At this time of year when the days are longest, keep your eyes open for june berries and mulberries, ripe in mid-late june, followed closely by currants, goose-berries, some early plums, then cherries! Many of these trees abound in our common spaces, often planted as ornamentals or street trees. Fruiting mountain ash, Asian pear, quince, rugosa rose, aronia, currants and more to 'Ape-town', n. of M'wood shops, Conz. St.
And medicinal ground covers to our large planting and berry hedge at the Hampshire Council of Governments, downtown Northampton. ~800 seedlings in the ground, humans and plants alike breathe a collective sigh of relief. Finally, we got hooked up with some helpful resources @ UMass Amherst - greenhouse space for starting herbs and tree seedlings, as well as 3 long nursery rows at the Agricultural Learning Center (ALC) on North Pleasant St., which now are temporary homes to more than 800 seedlings, busily growing strong and tall, awaiting public plantings - nannyberry, june berries, beach plums, white oaks and more. Check out the bursting-ly ripe juneberries (aka serviceberries) in front of People's Pint, Greenfield; First Churches, Paradise Copies and Sylvester's Restaurant (Northampton) and the Amherst Graveyard. Help Yourself didn't plant these trees, but they serve as mature models for the generosity and beauty of these native fruit trees. Quinces, fruiting roses and beach plums at mechanics along Federal St, Greenfield - Meineke, Cherry Rum and Tire Warehouse! 25 swamp white oaks (sweet acorns) @ Four Rivers Charter, Greenfield, and surrounding meadows. Replacement apples to Greenfield Center School. Some of the fruit trees we've put in over the past 3 years are starting to bear fruit! These include, sighted with small fruit coming in for the first time, the Harlson and Gravenstein apples @ Trans' Market in Hadley and the Rail Trail Connector, Northampton, the Chinese hawthorns @ PVCICS, Hadley, the Illinois everbearing mullberries @ the former Northstar Building in Hadley, the honeyberries, currants, elderberries, mulberries and wild plums at Four Rivers Charter School in Greenfield, and last but not least, the Concord grapes along the Rail Trail in Northampton are loaded with small green grapes! Check back in the late summer for a luscious treat! If you've been hoping to connect with the Help Yourself project, either by helping as a tree steward, helping on planting or work days, donating, or planting on your lawn, there's no better time than now! Meanwhile, happy mulberry picking! Looking forward to the growing season! Happy spring, folks! It's been a while since an update, taking a nice breather after falls intense planting episodes! As the epic snow accumulated, it was time to retreat and process the lessons of the past year into visions for this next one. As the snow melts and the rivers run high, we are finding that the vast majority of the perennials we planted last year made it through. A few were lost to rodents, though may re-sprout, and a few got killed by plows. Lesson learned - surviving one low snow winter and associated plowing doesn't mean a tree can handle the massive piles dumped in huge snow years. Heaps of snow at Frogtown, Maplewood parking lot, Northampton this Feb ('15). See eyes - the solar powered eyes are still glowing at night a year later! The frog basking in early spring sun, April '14. See hostas, cup plant (silphium), blue vervain, lillies, chives and oats all exploring the new 'no-mow' pollinator zone. 2014 was a big year for Help Yourself. 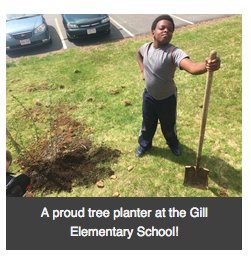 We handled more than 2,000 fruit and nut trees! About 400 went to our plant sale, a further 200 went into volunteer nursery beds in Greenfield and Belchertown, and the rest got in the ground at new and old projects like the Boys and Girls Club and 3 different community gardens w/ Nuestras Raices in Holyoke, K-12 schools in Greenfield, Holyoke, Montague and Gill, the Hampshire Regional HS in Westhampton, the Brookie Sculpture Park in Greenfield, businesses along King St, Northampton and many more locations! This winter, we've been working on compiling maps, maintenance logs, resources and steward directories for each of the 70 odd planting projects we've started over the past 2.5 years. It's a big task but it will streamline management and vastly increase the potential for stewarding relationships, and communication between garden volunteers. As the projects grow, we envision their surrounding areas joining the patchwork paradise. This spring, we've made another large plant order from One Green World, Twisted Tree, Cold Stream Farm, and other nurseries in the northeast. We'll be planting them in nursery beds in volunteer lawns in Northampton and beyond. This will take the stress off immediate need for planting, and give them a chance to mature over time - letting us plant hardier, bigger stock later, while being able to afford a large quantity of small saplings. 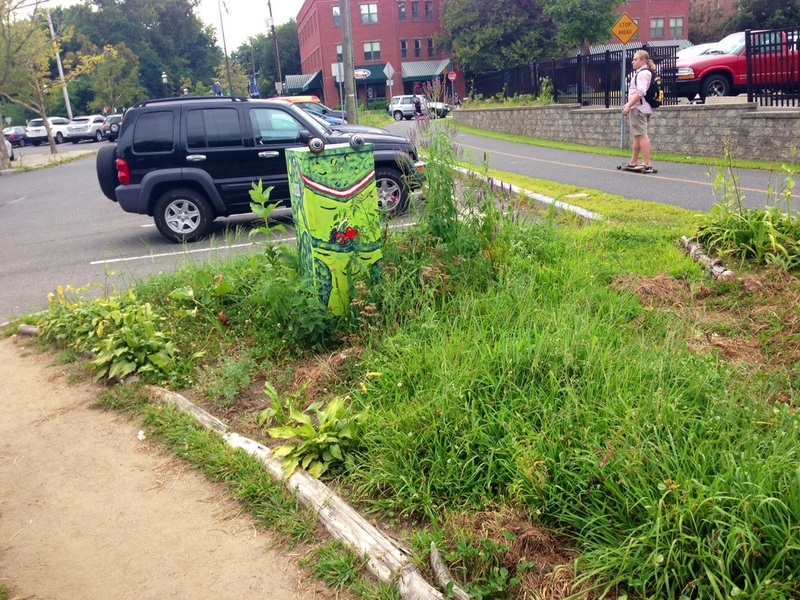 We've already broken ground along the bike path in Northampton. After pruning the 175 Concord grape vines, we're starting the cuttings in a propagation bed. More apple trees went in there, some to Just Roots community farm in Greenfield, whose HYS plants will be moved this year to a large public orchard on the farm. Four Rivers students planted paw paws and hickory trees at the Green River Rec Area, also in Greenfield. There are many exciting projects to expand this year, and of course, such potential to expand. Volunteer to be a tree or garden steward! This Sunday 4/26 from 12-2 we'll be tending to the PYO medicine plot at the Florence Organic Community Garden. Stay tuned for upcoming meetings and orientations. A Fall Fun(d)raising Festival to benefit Next Barn Over Farm and Help Yourself﻿'s growing goals of local food security. Be a local hero and help us raise 2,500$ to plant 50 PUBLIC ACCESS FRUIT TREES in Holyoke and support Next Barn Over's food justice in partnership with Gardening the Community." Please RSVP if you're thinking of coming, for a head count! COST: Suggested donation for all you can eat mutton and music - 10-20$. This is a fundraising festival with the goals listed above. If everyone pays just the sliding scale, it will probably just cover the cost of the sheep. We are asking folks to consider making a significant contribution, which is a direct investment in local food equity and security. What about donating 1 day's worth of work? One week? Remember, there may come a time when all the money in the world can't buy fresh fruit. Consider that each 25$ plants a new tree! 4 - Begin spit roasting sheep for feast! 9 - Bonfire, hang out, celebrate the fall while marinating in good company! On June 11th, HYS volunteers joined faculty and over 70 students at Hampshire Regional HS in Westhampton to plant 75 perennials at the school! We established a large orchard to the NW of the school, creating a big 'no mow' area, planted fruit trees in fruit of the school, and a shady fruiting hedgerow along the schools western edge. Gazette article about the planting. 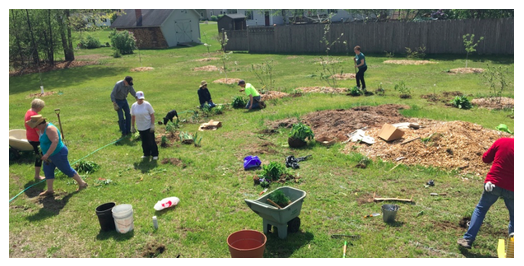 The students, directed by team leader Scott Green, broke into groups and got to work weeding, digging, planting, mulching, staking trees and sowing clover seed. Planting a Siberian pea shurb. This is a big step for a public high school, and sets a great precedent for what's possible in Hampshire County. This fall, as we look forward to a similar sized planting at the HS in the Montague school district, we hope to set a trend in which school grounds become not only outdoor classrooms, but learning opportunities and assets for the surrounding community, offering food and medicine plants as well as demonstrating permaculture planting sites. We're offering low-cost native plants that produce berries, roots, nuts and herbs for yards and gardens with a spring plant sale. They're from NH and NY state forest nurseries, and Cold Stream Farm in MI. The large volume of plants we ordered them qualified us for great discounts, and the overflow stock we can sell at reasonable prices to offset our costs. 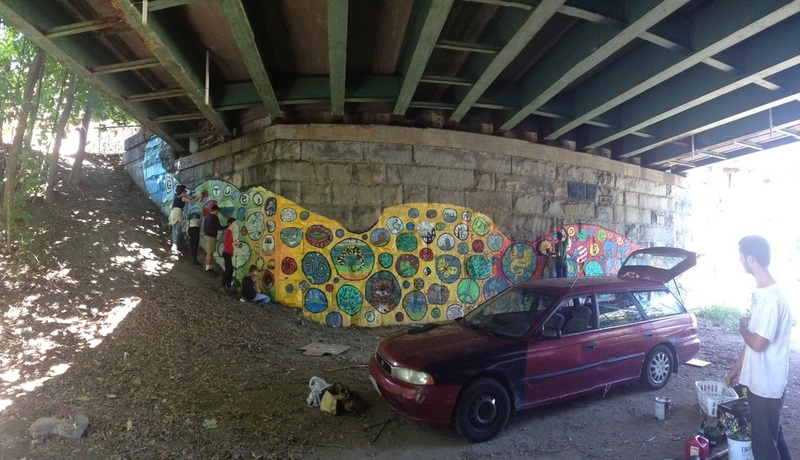 The proceeds will fund public planting projects this spring. Over their long lives, they will yield hundreds of pounds of fresh food. Plants are small, 1-2 ft. seedlings. Expect 3-8+ years for fruit. Pick up BARE ROOT plants in Northampton 1st weekend in May. All plants 5$ ea or 5 for 20$. Email helpyourself.noho@gmail.com to order, or use the form below! Black Walnut – tree, abundant edible nuts. 70 ft+. Plant 2+ for fruit. Space 30'+ apart. Sunchoke– Jerusalem artichoke w. delicious starchy root. Spreads, persists, productive. 6 ft.
Persimmon – tree w sweet fruit to 50' Need male&female for fruit. Unsexed. Space 30'. Hazelnut – American. Dense shrub to 10'. Need 2+ for nuts. Space 5-10'. Black Aronia – Chokeberry. Nutritious, astringent fruit used for juice. Shrub to 8'. It's time, people! The cardinals are singing, the robins are out of the woods, and... farther south, rumors of crocuses. Spring is around the bend and it's time rub the winter out of our eyes and gear up for another planting season. Well, maybe in a few weeks. Below is our incoming laundry list for this spring! Stay tuned for planting parties!